Johannesburg - Tiger Woods will get back into action on Thursday after a nine-month layoff from competitive golf owing to back surgery. The former world number one will tee up in the Hero World Challenge at Albany, New Providence, in the Bahamas. Woods is the host of this PGA tour-sanctioned tournament, which benefits the Tiger Woods Foundation. The event features 18 top-ranked golf professionals. The 14-time Major winner has been out of action for much of the past four seasons. He withdrew from the Dubai Desert Classic in February after back surgery. In April, he underwent his fourth back operation in three years. His injury-disrupted career has been marked by several attempts to bounce back into action over the past few years. Last month, Woods’ surgeon gave him the go-ahead to return to the professional side of the sport. Woods comes back to professional golf ranked at a disappointing 1 193 in the latest official rankings. However, he still holds the record for the most consecutive weeks ranked at number one – 281. He lost his title as the world’s highest-paid athlete to tennis star Roger Federer a few days ago. According to business magazine Forbes, Federer now leads the charts with $110.2 million (R1.543 billion) earned in career prize monies after he won some of his round-robin matches at the Nitto ATP Finals in London last week. Woods is now the second highest earner, with $110 million. He last picked up a pay cheque at the Wyndham Championship in August 2015. Woods has won the Hero World Challenge five times. He is looking forward to adding another scalp in the final round next Sunday, but it remains to be seen whether he will be able to claw his way back to the big time and take the trophy. He last won this contest in 2011, when he beat fellow American Zach Johnson by one stroke. The winner will take home $1 million. Last year’s event was won by Hideki Matsuyama from Japan, who beat Swede Henrik Stenson by two strokes. 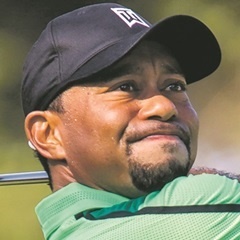 This tournament may well spell the return of the embattled Woods to competitive golf, however, many believe the player will once again be ruled out due to injury.